by new parameter EnableUnsafeFixes as game bring another bugs with it enabled. Also new version have support for localization help popup. 23 feb 2016: updated binaries (ENBSeries 0.303), removed previous fix for microstuttering, because world map mouse control don't word by vertical axis, game is absolute satan sent mess. 22 feb 2016: updated binaries (ENBSeries 0.303), added fix for microstuttering, some physic and scripting behavior bugs. It always enabled from now. 20 feb 2016: updated mod config, added new file with setting based on tests by users, with better performance. 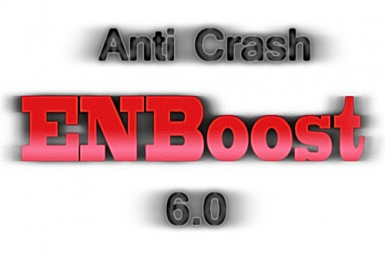 ENBoost is a patch for memory limitations of the game, some optimizations and other fixes. turn depends from CPU, OS and some other software installed (overlays, screen captures, etc). disable (but keep memory setting only), set DatasyncMode=0 and PriorityMode=0 in enblocal.ini. may help to load game and resave it again in less stressful place for the engine and scripts. by users as the most performance efficient and stable setting. run Windows Vista/7 x64. Less effective will be with x86 versions of XP/Vista/7. for modded Skyrim at this moment, especially for videocards with more than 4 Gb VRAM. of downloaded file to your old one. with some of values set under [THREADS] category of enblocal.ini. report your finds too in comments. performance in bad way, so it's recommended to restore default values. Steam beta (reported at 22 feb 2016) leads to stuttering and low fps with ENB, so disable it. any new issues (like not working vertical axis of world map), set it to false and check again. buffering enabled. Update to new one and disable tripple buffering. 1) No DirectX Runtime Standalone installed. Download at M$ web site. 2) Crapware (check ENBoost 5.0 description about this), antiviruses, Steam overlay, NVidia GeForce Experience. 3) OneTweak mod (as reported by user) disabled Bethesda logo causes crash. binary files (exe, dll, ocx) of my projects on Nexus web sites is not allowed.